Amy LaVere routinely gets antsy after she's been off the road awhile. Born in Shreveport, Louisiana and a native of Bethany, Texas, she's really more a child of America - a self-described "General Motors brat" whose father's jobs kept her small family frequently on the move. Her life as a touring musician seems tailor-made for a woman who is seemingly one part upright bassist and another part gypsy. Some of my top favorites would include Ray Charles, Willie Nelson, Joni Mitchell, Pink Floyd, Prince and Leonard Cohen. It may seem like it would be hard to explain why a national artist from Memphis that has been hosted on MTV and The Conan O'Brien Show has ended up at IQ's on a Tuesday night, but it is not. Many road faring musicians look for pick up gigs in between their major weekend gigs, and that is how the Amy LaVere three piece made its way to IQ's after a swing back from Door County. I was invited to come check out Amy down at IQ's and after a good week of research I was so excited! It was like a hearing a freight train off in the distance get closer and closer. When I got to IQ's my jaw hit the floor. Did someone heist all the Heather Peterman's off the wall? There was not a single piece of artwork hung on the walls thanks to IQ's laying down a fresh coat of paint. This only adds to my statement of you never know what you will see down at IQ's. With the Roadhouse Scholars ramping up the energy for Amy LaVere I was ready to see what this southern locomotive was haling. The Trio consists of Amy on lead vocals and upright bass, Paul Taylor on drums/vocals, and Steve Selvidge on electric guitar/vocals. 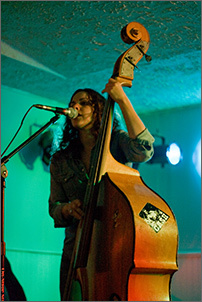 Amy LaVere is all Memphis, blues insulated with tones of country, folk and jazz. Imagine articulate hill billys, strongly influenced by blues, jazz, funk and honky tonk covered in its dirty southern sound. Amy’s voice is as light as air; she has a soulful tone that is unique and always sounds as if it is on a sheet of thin ice, but never will fall through on her smooth tone. For me the concept of this band was really interesting. Based in blues the use of Amy's upright bass seemed a little out of place that is until you get used to it. 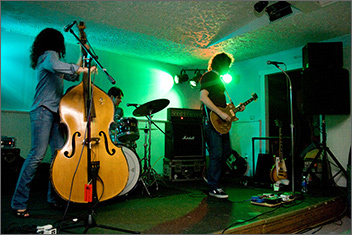 They have a unique fusion of genres and songs that is ultimately cool and her upright bass added to the unique sound. Steve's electric guitar is to die for. Steve's compositions and tone are beautiful. Running a couple of Gibson Les Pauls, one of them armed with p90 pickups, going into a 1963 Silvertone tube head which is the equivilent of one of the best warm tones I have ever heard! Paul Taylor's work on the drums was loaded with precision and interesting fills. For me it was a little odd hearing the drums not playing in a pocket feel for this style of music. Paul's technique must have been using the space in the notes as he constantly grabbed the cymbals to mute them. Paul’s speed and creativity was key in keeping this trio locked tight. It is no wonder why Amy LaVere has had mentionable success abroad, the music is an alternative rock southern soundscape full of soul and emotion. You can check out Amy LaVere at her website or check out a video from the show on the GreenBayNightLife.com.